Hale and fair winds to one and all! This is a shout-out to my distant cousins who come from the far flung clan Beluche and to pirates and lover of history - particularly maritime history - everywhere. Above is a bust of my ancestor, Renato Beluche. 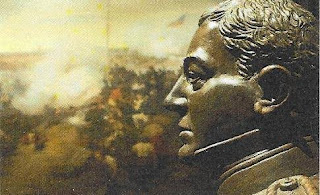 I know the Brethren are familiar but for anyone who would like to know more about this man's contributions to the life and liberty of the United States and the greater Gulf region, click on the label at the end of this post. This bust, executed by a Venezuelan artist in the 1950s, was donated as a gift to the Louisiana State Museum. It was unfortunately swiftly relegated to an attic in the Cabildo in New Orleans for over half a century: disrespected, unseen, nearly forgotten. Thanks to the Friends of the Cabildo and the hard, dedicated endeavors of people like my particular friend and distnat Beluche relation Thais Solano, the bust was found and restored. This just in time for the Bicentennial exhibition celebrated the Battle of New Orleans. This is currently on exhibit at the Cabildo and I highly recommend it. Beluche's bust features prominently in the exhibit with pride of place in the first hall. The problem? The Battle of New Orleans exhibit will be taken down in October of this year. Where, we as Beluches' descendants and admirers wonder, will his stately bust end up? We need your help, Brethren, to ensure that this does not happen. We need to you to raise your voices - as only we pirates truly can - to insist that the bust stays on permanent display. The options are many, but what a wonderful home could be made at the home where he was born on Rue Dumaine. This former private residence is now known by the fictional name of Madame John's Legacy and is part of the Louisiana State Museum as well. Please take a moment to email Mr. Tulios at the Louisiana State Museum at mtulios@crt.la.gov and respectfully request that Beluche's but remain on display permanently. You can also reach out to Jason at the Friend of the Cabildo at Jason@friendsofthecabildo.gov with the same request. The more people they hear from, the more seriously they will take this petition. The moment is now. We need to act. I count on the Brethren to come through to preserve a fading part of the maritime history of the Americas: the memory of Renato Beluche. Please leave your comments with any questions or concerns, or to let me know if you had any response to your emails. Finally, thank you my dear friends. My heart is still here, with Triple P, even if my mind must be elsewhere.